And guess what? 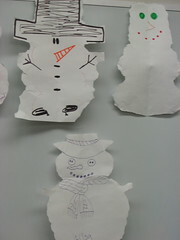 My malaysian snowman (the one at the bottom) won the behind-your-back-hand-torn-snowman competition. And I got a $10 Barnes and Noble giftcard 🙂 It was only later that I noticed almost everyone else’s snow-people consisted of 3 balls of “snow”, while mine was only made up of two! Anatomically incorrect? Last friday, the research center had its year-end party. There was food and games. One of the games was to tear out a snowman from a piece of construction paper but the catch was to complete the whole process while holding that piece of paper behind our back. 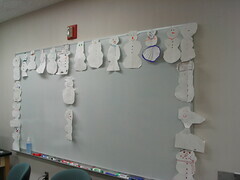 Here are all the snow-people, not snowmen, because there was one snow-woman wearing a bikini top and a hula skirt! Up till this afternoon, my Christmas plan was to stay put, work on my qualifier, have a small party, go to church and then someone’s house on Christmas eve, and also experience what it is like to have three Korean women in the apartment (my roommate’s mom and sister are coming over from South Korea for a visit). But my plan changed almost instantaneously. New Covenant, the church that I am attending now, has this wonderful baby dedication song that the pastor and music director co-wrote. I thought I would share that with you. Friday, December 8, was supposed to be THE day that I present my qualifier to the faculty. Unfortunately, there were too many major changes to my introduction section that I had to put aside data analysis and take the whole Thanksgiving break just to revise that. So, I ended up not making the deadline. I am uncertain if I should feel relieved or saddened by the fact that things are now pushed to another semester. Yesterday, I spent two hours discussing my data analysis and research questions with my advisor. Towards the end of the meeting, she asked me if I wanted to articulate my research questions to her then or spent some time mulling over it and then meet with her another day. By then, I was so drained, and all I could think of is that I have a concert to go to in Philadelphia. So I am meeting with her again on Tuesday. As for the concert, I got a last minute invitation to join Becky and her friends to a concert in Philadelphia. Over the Rhine was playing, and they are Becky’s absolute favorite band. How can I resist a free trip to Philly to watch a concert that I do not have to pay for? The husband-and-wife team was really good, not really mainstream music, but they definitely have a strong following. If you are visiting their site, I recommend listening to some of their songs on the “radio player”. 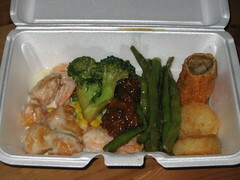 Occasionally when I start craving for chinese food, I’ll go to the nearby chinese buffet restaurant. But instead of eating there, which will cost me around $8, I will carry-out (tah pau) instead. The carry out rate is $3.29 per lb of food. The packet shown here costs $2.60. If you think that your neighborhood mix rice (chap farn) store lacks variety, welcome to my world. The restaurant offers the same buffet line day-in and day-out. So, what’s in the box? 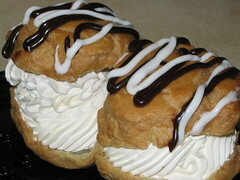 I bought this wonderful looking cream puffs today. The store labelled it as gourmet cream puffs. Instead of having the usual custard filling, these are filled with a LOT of sweet whipped cream. After going through about a third of the creamy filling, I started getting the “jelak” feeling. Too much of a “good” thing. 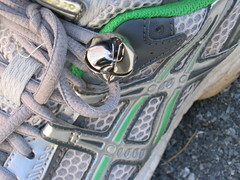 But I still think they look so very tempting. Grad students are like penguins…. We’re always cold and hungry and we look funny when we’re running.